I can’t believe how quickly time has gone as we are at the beginning of December already. I made a decision at the end of June to close the shop in Church Stretton and concentrate more on markets, fairs and the alpacas. Closing the shop was a fairly easy decision to make as Jen Bartl who was working in the shop with me was very keen to take it on and keep it going as it is. So at the end of October Jen took over as The Prolific Crafter and I have been very busy since then doing Markets and Christmas fairs which will carry on now until Christmas. All the sales of my alpacas went well and they have all found lovely homes ranging from Cornwall, Shropshire and North Wales. The three boys that went down to Cornwall were a leaving present for lady who was a teacher at the Queen’s school in Chester and all the staff at the school and her family managed to keep it a complete surprise! So the plan was that I drove the 3 boys up to the school on the last day of term and park them outside the main school door and they were presented to her with the school watching via video link! 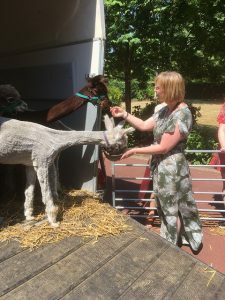 She was absolutely stunned when she came out of the door and couldn’t believe they were for her as it was always her dream to have alpacas – it was lovely to see and to be part of making someone’s dream come true. The run up to Christmas is always busy and we have a lot of markets and fairs booked from now until Christmas – check out our Events page for dates of the different markets and fairs we are attending. You just can’t beat alpaca for keeping you warm and more and more people are keeping alpacas and appreciate the benefits and quality of alpaca wool. A very warm wishes to everyone over the festive period.